Acorelle Tea Garden Perfume is a fragrance which harmoniously blends the freshness of citrus fruits—lemon and bergamot—with the subtle sweetness of Moroccan mint leaf. A rich powdery floral aspect is supplied by Florentine iris and patchouli, as well as Virginian cedar and Argentinean gaiac wood. This dynamic blend of fragrance is designed to keep you energized. 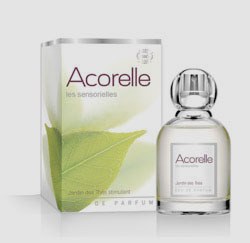 Fine French Fragrance—made with organic alcohol and 100% natural fragrance materials. No synthetic fragrance. No phthalates. Ingredients: Organic Alcohol 80% vol., water, fragrance.